Phillip Fulmer is a former college football coach who coached for the University of Tennessee from 1972–1973 as student coach, Wichita State from 1974–1978 as offensive line / linebacker coach and Vanderbilt in 1979 as assistant coach. He returned to the University of Tennessee first as offensive line coach from 1980–1988, then as offensive coordinator / offensive line coach from 1989–1992 and again from 1992–2008 as head coach. In 1997 and 1998 the University of Tennessee won the Southeastern Conference championship and in 1998 they won the National championship. In 2012 Phillip Fulmer was inducted into the College Football Hall of Fame. Sports Speakers 360 is a booking agent for pro athletes. 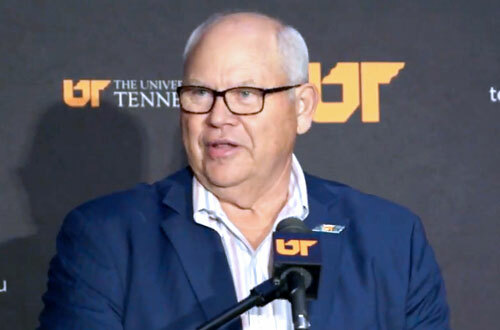 If you would like to book Phillip Fulmer for a speaking engagement, appearance or endorsement, contact a Phillip Fulmer booking agent for fees at 1.855.303.5450.